Ski In Ski Out house - Directly on the out to Lunch Trail! SKI-IN SKI-OUT 5 bedroom, 3.5 baths home located on Upper Village Drive in the Sugarbush Village and just 15 ft. from the Out To Lunch Trail! This spectacular 3600 sq. ft. house features; Post and Beam construction, wide plank pine floors, beautiful mountain views, lots of natural sunlight and open floor plan with cathedral ceiling. House is tastefully decorated and fully equipped with surround sound stereo system throughout the house. The backyard abuts the ski trail (The Out To Lunch Trail is 15 feet from the house) Spectacular views of Steins and North Lynx can be seen from the large deck. House sleeps 10 comfortably and is fully equipped with washer/dryer, cable and flat screen TV's. 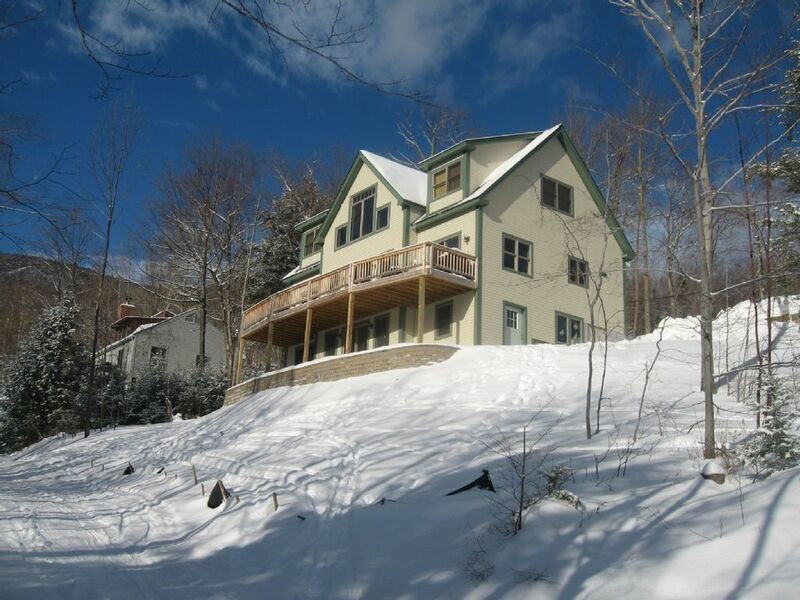 Walk (or ski) to Sugarbush Village, Sugarbush Health & Racquet and Timbers. This is the ultimate in ski vacations - drive here, park the car and never leave! Master bath has radiant floor heat, shower is tiled with two shower heads, large vanity. Full bathroom on upper floor is very spacious with a bath/shower combination. Full bathroom on lower level also has bath/shower combination. Post and Beam construction, wide plank pine floors, beautiful mountain views, lots of natural sunlight and open floor plan with cathedral ceiling. House is tastefully decorated and fully equipped with surround sound stereo system in most area of the house. The backyard abuts the ski trail (The Out To Lunch Trail is 15 feet from the house) Spectacular views of Steins and North Lynx can be seen from the large deck. Wake up in the morning, relax with a cup of coffee. No rushing to get into the parking lot and trudging with all of your gear up to the lodge. After enjoying your leisurely breakfast, get dressed, walk down to the heated ski room, put your boots on. Open up the door and ski away,..... This is skiing! Mad River Valley offers a variety of activities year round. From skiing and snowboarding to hiking and mountain biking, our house is located in the center of these activities. Burlington and Lake Champlain are only 50 miles away.